I guess I should thank my grocery store for this post. If it wasn’t for the fact that they suddenly stopped stocking bulgur, I would probably still be on my last breakfast obsession, but since it’s been missing in the bulk section for weeks, I’ve been forced to move on. But it’s okay, as this is the time of year when I start mixing in some cold breakfast options. Spring = cold breakfast + warm coffee! You know, because it’s not quite cold enough for hot breakfast and hot coffee or quite cold enough for cold breakfast and cold coffee. I’ve been mixing up this overnight oatmeal a few times a week and it straight up tastes like desert! 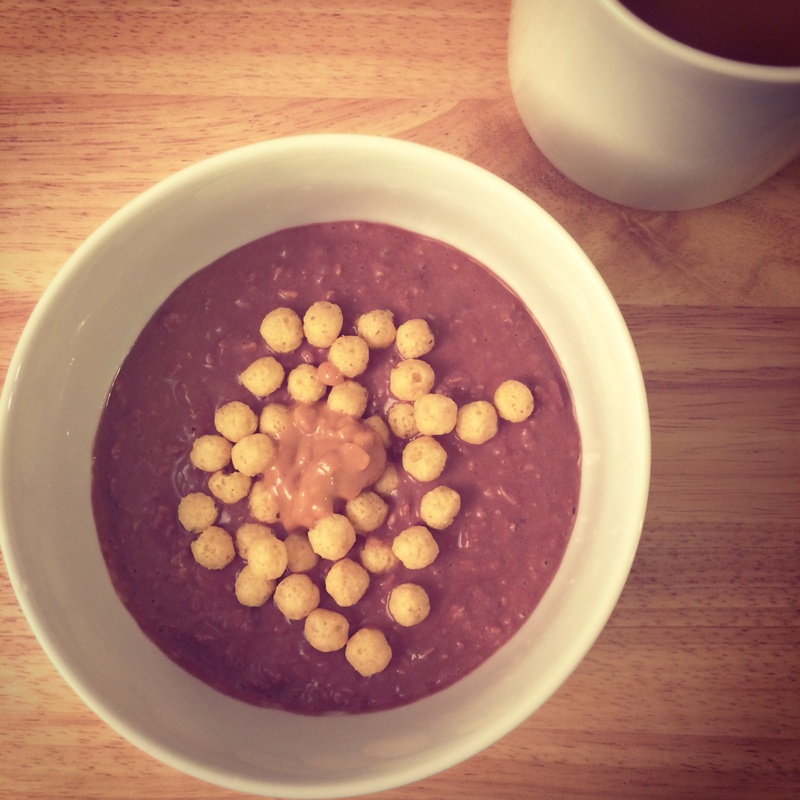 I’ve always loved that thin line between breakfast and desert 🙂 I took this recipe and changed it up a bit to create a chocolaty oatmeal creation that tastes indulgent but is actually the perfect healthy breakfast choice. Win-win! The night before, I mix 1/3 cup each rolled oats, almond milk and Greek yogurt, plus 1 tablespoon each cocoa powder, maple syrup and most importantly, chocolate chips! Then you just stick the whole thing in the fridge overnight and in the morning, all you have to do is microwave it for a few seconds to take off the chill (unless you like the chill), add some fun toppings (peanut butter and Panda Puffs, for the win!) and enjoy. P.S. All I can imagine as I’m writing this post is my mom (a serious oatmeal hater) reading it and thinking it looks like the most disgusting breakfast ever. I swear it’s good, Mom! Mmmmm…that looks so good! I am incredibly unopposed to chocolate for breakfast provided it is incorporated into something hearty (aka. like your creation). My current breakfast of choice is oatmeal, something I haven’t eaten regularly for at least a year. I’m usually more of an eggs girl. But I’m spending a month in a rural town for school, and the whole “not being at place with my normal pots and pans” has made me into a microwave junky. So I’ve become really good at making microwave oats. Top it off with some nut butter, fruit, and a handful of granola. Perfection. I don’t know when this happened but I cannot stand eating anything for breakfast that takes longer than say five minutes, oatmeal included! So I’m all for your microwavable oats. You know me so well. And at first glance, I thought those were garbanzos on top which would really have upped the yuck factor. If course you know my favorite breakfast — red velvet cake and a cup of coffee.